This post may well be one of my more eccentric entries. See, every day I undergo a fairly significant commute, and in order to keep myself sane I listen to podcasts. Two of the most recent were TED Talks on urban beekeeping and edible landscapes. Okay, interesting stuff, but why talk about them on a Bible blog? 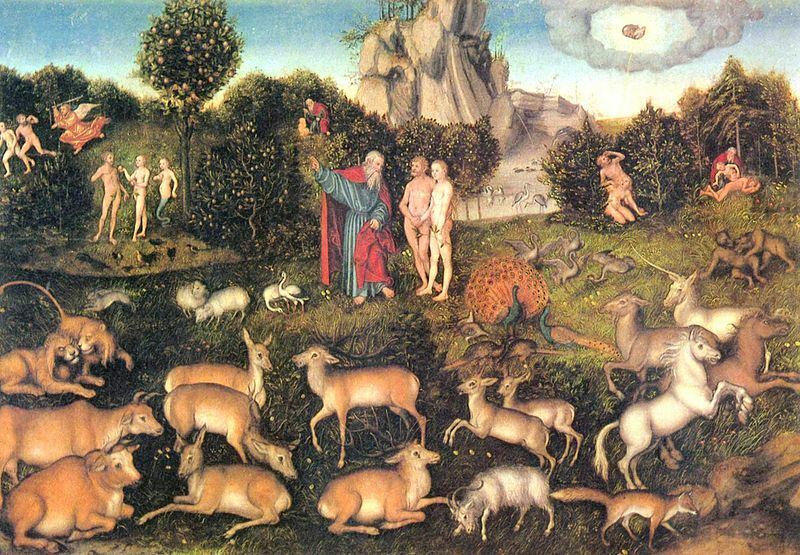 Well, the Garden of Eden is a potent symbol – a place of beauty and fulfilment and communion with God lost after the Fall. Well, yes, Adam and Eve got banished, but there’s a thread running through the Bible of gardens representing restoration – Amos 9:14, for instance, and why are two of the key locations in the restoring and reconciling story of Easter gardens? Right at the end of the Bible, Revelation 22:1-3 bookends things by harking back to Eden when creation gets restored. And so gardens become symbols of restoration as opposed to the loss of paradise. This is why a branch of the Ethiopian Orthodox Church has a fascinating tradition. Effectively they plant forests around their churches as symbols of Eden, providing a haven for God’s creatures physical church buildings become pictures of a God who provides and cares for creation, of how creation as a whole is healed through the work of Christ, not just on a spiritual level. So what might this mean for churches in the West? After all, we travel in cars to air-conditioned buildings. The car-park is tarmacced and we only notice the weather if it’s apocalyptic. We’ll sing worship songs about God as creator, but we won’t get too lose to the creation – the flower arrangements, sure, and technically the coffee afterwards. Are we missing out on something? So what might it look like if churches gave over part of their land to celebrating God’s creation? Vegetable gardens, for instance, or beehives on the roof, or a patch of land allowed to grow wild to encourage both biodiversity and contemplation, and with reminders throughout to remember the creator? What if a chunk of the church’s land was dedicated to growing stuff then saying to the needy “Help yourself”? What if our harvest festivals were celebrations of the produce we grew and harvested ourselves, and how God used that to bless others? Like I said, this may be one of my more eccentric posts, but it’s an idea that won’t leave me alone. In a world where so many people don’t eat properly and where wildlife is threatened, where people living in care have lost their gardens and where gardening can be a powerful rehabilitative tool, there’s something to be said for remembering Eden, for remembering that the curse that barred us from the Garden is now broken and that our relationships with God and creation are now being restored. So maybe your church doesn’t need another extension. Maybe it needs a garden. This entry was posted in Bible, Christianity, Genesis, God, Old Testament and tagged biodiversity, creation, Garden of Eden, gardening, nature by Matt. Bookmark the permalink.